Amazing Adventures and Terrific Tall Tales for older readers who are ready to sink their teeth into something fun. Fun, Fantastic and Exciting Boys, Girls and Parents will Love Reading Genies, Giants and a Walrus Award-winning author and storyteller Mark Binder has collected some of his favorite adventures from across the globe and put them together in one collection for the entertainment of all. Thor... Scheherazade... Paul Bunyan... Clever Doris? Enjoy discovering the original myths that inspired the videos. Find new stories to make you smile. Magic and Myth, Tricksters and Theft Wits Win and Tales Triumph Kings, Wolves, Princesses and Lions will amuse all readers "Genies, Giants and a Walrus" includes some of the world's best adventure stories, selected and edited for the pleasure of voracious young readers. From Gilgamesh and the Arabian Nights to Norse Mythology and the American West, these are stories that both girls and boys will enjoy reading and rereading. is an excellent primer for young readers... Classic tales retold with new energy... New tales that seem timeless, and a few old favorites that preserve the flavor of years gone by. 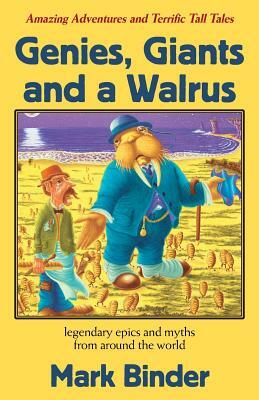 If you liked "The Bed Time Story Book" or "Kings, Wolves, Princesses and Lions," you'll love, "Genies, Giants and a Walrus." You can read them by yourself, or with your family. Award-winning author, Mark Binder presents this collection of stories with the ear of a professional storyteller and the love of a parent reading to his family. ..".a gift for humor -- both broad and subtle..." - Publisher's Weekly ..".author and storyteller Mark Binder is the spellbinder..." - School Library Journal Part of the best-selling "Bed Time Story Book" series, this collection takes it to the next level of literary pleasure. Target ages: Genies, Giants and a Walrus: Grades 3-5 Kings, Wolves, Princesses and Lions: Grades 1-3 The Bed Time Story Book: Grades PK-2 Some of the world's finest heroes and heroines make appearances, including, Scheherezade, Thor, Paul Bunyan and Clever Doris. Includes plenty of witches, giants, genies and of course, a Walrus. If you don't know these stories, you'll soon learn why so many of them are classics... Author and storyteller Mark Binder reworks, revises and invents stories that feel fresh while maintaining a strong connection to the past. The collection ends with a brief selection from some of the finest poetic stories ever written in English, including Kipling, Lewis Carroll and Casey at the Bat. Guaranteed fun for all.